1. Since an ActiveX Listbox is not presented in a "Dropdown" format, it is mentioned for completeness only. Various methods can be used to extract list data from Excel. These include office interoperability methods using late or early binding and ADODB using early or late binding. 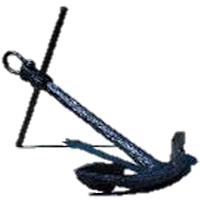 Note: An early binding method is demonstrated in the support forum discussion referenced above. and a header row is used. If Not bHeaderRow Then strHeaderYES_NO = "NO"
If bIsSheet Then strRange = strRange & "$]" Else strRange = strRange & "]"
"Extended Properties=""Excel 12.0 Xml;HDR=" & strHeaderYES_NO & """;"
For the "Simple List" example, the arguments passed to the function and resulting array returned are shown below. 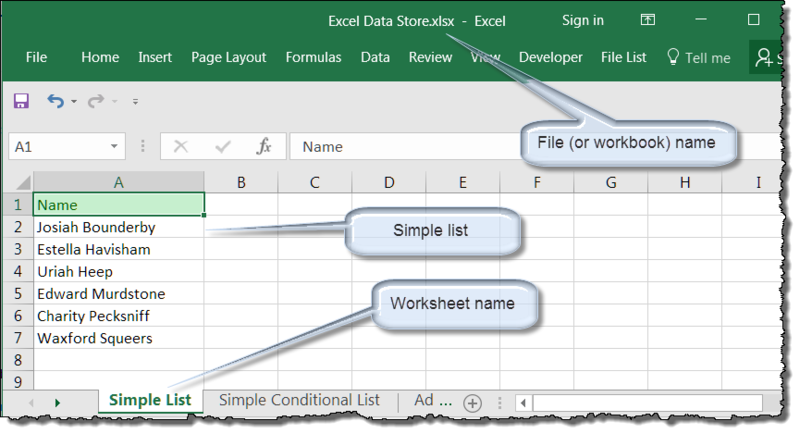 You should notice that the data (the simple list) is defined in an Excel workbook named "Excel Data Store.xlsx" The workbook path and and sheet name "Simple List" are passed as arguments to the function shown above. Note: By default, arrays are zero based. In the array represented above, arrData(0) represents column 1 of the sheet range. 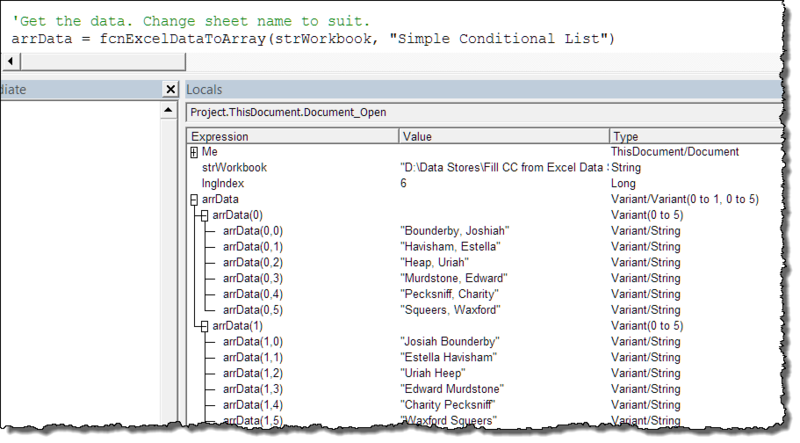 Likewise, arrData(0, 0) contains the data defined in column 1, row 2 of the sheet. Why row 2? Because the header row (row 1) is excluded from the data returned due the default value of the optional parameter bHeaderRow. 'The Excel file defining the simple list. Change to suit. 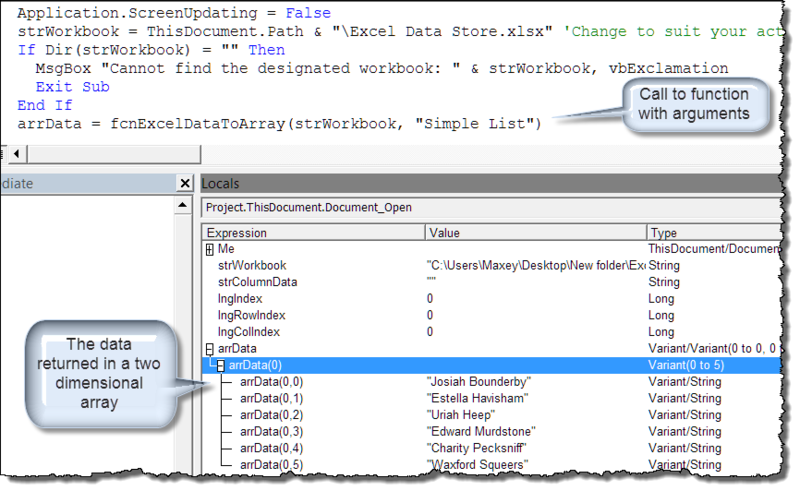 strWorkbook = ThisDocument.Path & "\Excel Data Store.xlsx"
'Get the data. Change sheet name to suit. 'Assumes no placeholder entry. Simple clear list. Look at the array returned. The scope of the first dimension (columns) is now 0 To 1 (or two columns). The array includes data from both the "Key" and "Name" columns. Case "CC Conditional Dropdown List"
Note: The object model has no direct way to do this. ... we can select one thing from the displayed list e.g., "Heap, Uriah" (the condition), and display "Uriah Heep" (the result). Note the "~" used in the Excel data to delimit the address field line. 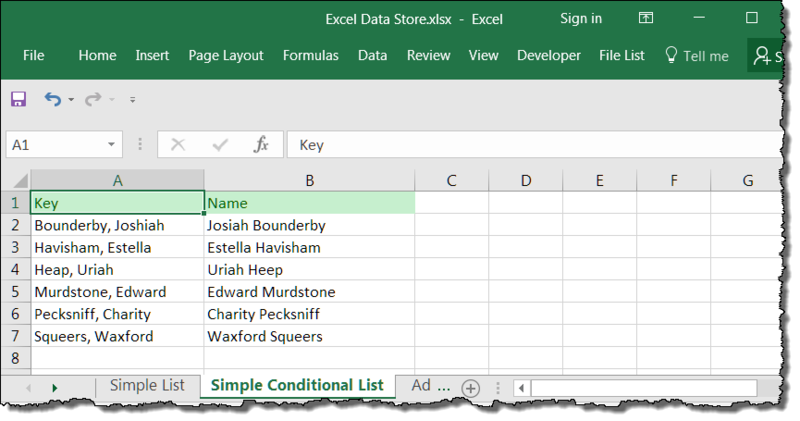 Now with just a few adjustments to the Document_ContentControlOnExit event procedure, we can select a listed item and based on the item selected display the appropriate result and fill the dependent fields. The document, all the code and the Excel data sheet used to create this tips page and examples can be down loaded here Demo Pack. Just unzip the contents to the same folder and open the Word document. Note: This tips page, illustrations and examples were developed using Word 2010. It is wholly functional with Word 2007 through 2016.